I originally asked for a solution which would automatically give me the range of subfigures in a caption. Skillmon came up with something which did work with my original MWE, but which gives problems with cleveref and besidecaption (from komascript). The reference produced by cleveref is wrong. It should be 1a–d, but it is instead 1a––cd. The caption is missing the subcaptionbox in the the captionbeside environment and therefore only prints 1a–d instead of 1a–e. I more or less understand what is happening in the the case of captionbeside, but the interaction with cleveref is beyond me. Here is a version which does work with your MWE. I changed the way it works to using global definitions and not changing the formatting of the counter it's used for but by changing the way the caption package does print its caption labels. Not the answer you're looking for? Browse other questions tagged captions koma-script subfloats subcaption cleveref or ask your own question. 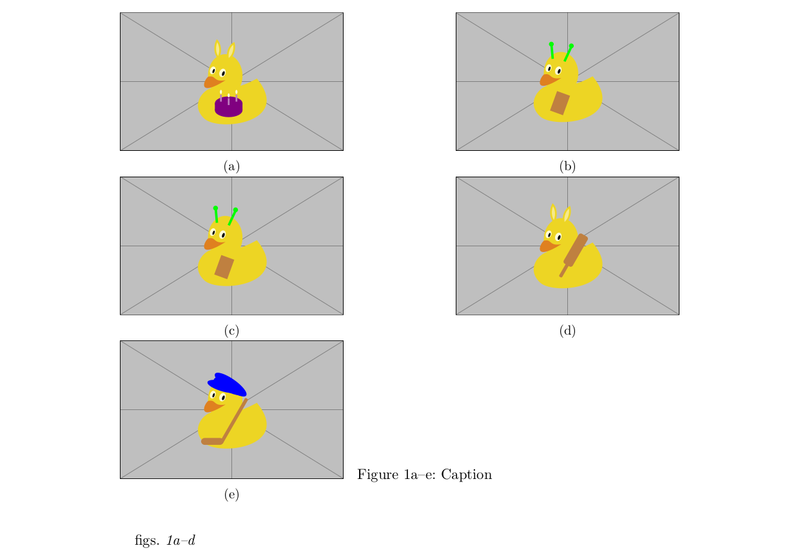 cleveref and subcaption: how to handle subfigure reference?